What Jeb and Hillary Have in Common Neither party is in the mood to continue a dynasty. The other day I saw Jeb Bush looking comfortable. It was startling. He was on TV, in a modest midday interview on Fox News Channel, answering a question about the pope’s comments on abortion and forgiveness. He said we all should be more merciful. He didn’t look like the Unhappy Warrior. Normally he sort of bobs back and forth on the screen, shrugging out responses like a distracted mother on the playground checking her phone, or a jittery tennis player who can’t, in repose, stay still. But he was pleasant, fluid, in the moment. Maybe as fall begins, as the summer in which he was eclipsed by Donald Trump ends, he’s going to get comfortable. Maybe he had to find himself in reduced circumstances to wake up. Maybe he had to look into the abyss to realize it’s not an entitlement, it’s a battle. 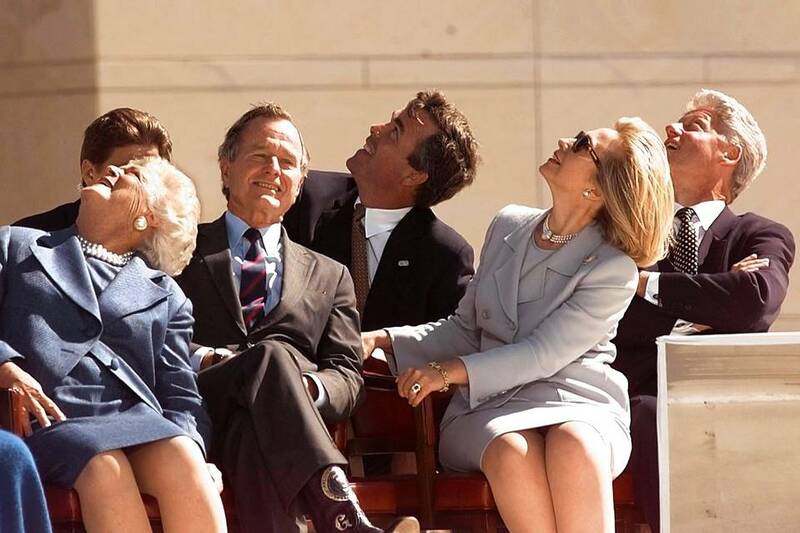 Former US president George Bush, his wife Barbara Bush, their son Jeb Bush, First Lady Hillary Clinton, and US President Bill Clinton look up to see the US Army Golden Knights parachute team on November 6, 1997 at the conclusion of the dedication ceremony of the George Bush Library in College Station, TX. We’ll see if that becomes an autumn storyline. I still don’t see it working for Mr. Bush, but with money and organization like his you don’t just disappear like Herman Cain. You stay and fight. It would be humiliating not to. So you go at Mr. Trump, maybe start having fun, maybe come to see a deeper rationale for your candidacy. At least you’re trying to stop that Vandal, that Visigoth. You have a purpose. You’re not just next in a dynasty. They always say of candidates who aren’t so good on the stump, “But you should see him in the room!” Listen, they’re all good in the room. I’ve never seen a candidate who wasn’t. Politicians are warm-blooded animals; they come alive in groups with regular people (thank God, a normal American who’s awed to be with me!) and potential donors (thank God for money!). Jeb has always been said to be good in the office—literally sitting in the governor’s office, judging policy proposals. There he has all the sophistication and fluidity of Bill Clinton, but Mr. Clinton uses it just to talk and impress you with his range and acumen. Jeb, as governor, used information to start, end or reorder a program. Talking wasn’t an end in itself. But it’s still unclear how to translate “good in the office” into support. Six and nine months ago at various events people would cross the room and ask me, with some urgency, “Can Jeb win the nomination?” They were so hopeful. And they were all Democrats. They wanted an alternative to Hillary. I realized Jeb is a Democrat’s idea of what a Republican contender should be. Among Republicans of course he has some supporters, but the only really rabid pro-Jebbers I’ve met the past few months are former Bush 41 and 43 ambassadors who want back in the game. Of more immediate possible import, talks with Jeb donors suggest theirs was not passion money but canny financial bets placed when he was inevitable. This week’s thought on Mr. Trump: The shrewdest words on him from another candidate were Chris Christie’s observation a month ago that Mr. Trump will be as good a candidate as he wants to be, which implied that others would not bring him down, but he could bring himself down. My thought, which is really a question, is that candidates for president, while natural competitors, sometimes get to the point where they think they are going to win, and it messes with their heads. Maybe they fear, deep down, that they’re not quite up to the office—their skills don’t match its demands, their psychological makeup can’t withstand its burdens. They start to think: A guy like me shouldn’t be president! At that point they begin to undermine themselves with poor decisions and statements. I’ve wondered about what Mr. Trumps’s inner workings might tell him in this area. Sooner or later we’ll find out if he has any taste for self-sabotage. That of course would only happen if in his mind the White House, the office of the presidency, holds a certain mystique, certain historic vibrations: “Lincoln walked here.” “FDR found out about Pearl Harbor in this room.” I’m not sure everyone has those feelings anymore. They used to. Poor Nixon wouldn’t put his shoes up on a hassock unless he covered it with a towel, because it was White House furniture. We finish with Hillary. I am more deeply skeptical of her prospects for the nomination, even with the money, the organization, the endorsements, the inevitability. After this summer she looks very evitable. In the abstract, before a campaign, she’s always impressive—so famous, so accomplished, the first woman, we know her. And then she starts to campaign and she’s in your face and its not abstract anymore and you’re reminded of everything you don’t like, everything you have qualms and doubts and fears about. I don’t see how it works now. Her polls are on a downward drift. In Iowa Bernie Sanders is within striking distance: “This looks like 2008.” People don’t trust her; the famous word cloud—“liar,” “dishonest,” “untrustworthy”—was damning because it said it all. She doesn’t embody the current spirit of her party—she is too close to Wall Street, too grubbily self-enriching, too hawkish. She’s poor on the stump, comports herself like royalty, and in interviews and press gaggles there are the dead, disingenuous eyes. She shows impatience at having to answer questions as if she were just anybody. The national press corps has no special love for her. They won’t grill her on the skillet of their skepticism as they would a Republican, but they won’t carry water for her either. And the email scandal is not a scandal anymore but a continuing crisis. It will dog her as the FBI investigates. For all its complexities, everyone understands the story’s outlines. As secretary of state she wanted to use her own private email system because if she were part of the government’s system she wouldn’t be able to control it; her communications would someday be public record, vulnerable to freedom-of-information requests. She wanted secrecy as she did business the public shouldn’t know about or wouldn’t understand. If that resulted in a less secure system, one more vulnerable to hackers—well, she wants what she wants. She would be the one to determine what is made public. After that determination the server would be wiped clean. This is high-handedness not toward political foes but toward history and the people’s right to know. It reminds you of every scandal in the past and suggests more in the future. Yes, she remains strong in the polls, but not as strong as she was, and it’s not hard to envision steady attrition ahead. Joe Biden should get in, if he has the heart for it. If this summer has taught us anything, it’s to expect the unexpected. A reality-TV star with no previous experience in elective office is running first in the Republican party. Neither Jeb nor Hillary embodies the current spirit of their party. Among Republicans that spirit includes hunger, anger, joyful aggression, a mood of “tear it down” competing with a mood of “build something up.” Among Democrats there’s a tilt leftward, against power centers, rebelling against inevitabilities. Neither party seems all that invested in continuing dynasties.